This page is here to give you easy access to all the features I’ve published on Pandora bracelets! PANDORA FAQs: A general list of frequently asked questions about Pandora bracelets. The Basics: Pandora Bracelets for Beginners: This page gives you a break down of the basic pieces that make up a Pandora bracelet, explaining the functions of clips, threads, safety chains and spacers. The Basics: How to Size Your Pandora Bracelet: A run down of everything you need to know about selecting the right bracelet size for your wrist. The Basics: How to Tell if a Pandora Charm is Fake: Explains how to identify counterfeit items of Pandora jewellery. The Basics: How to Care For Your Pandora: This post explains how to clean and store your Pandora properly. The Basics: How are Pandora charms made? : This post goes through the provenance of Pandora charms and how they are made. FAQs on the Pandora Leather Bracelet: This page answers all your questions on the Pandora leather bracelet. FAQs on the Pandora Oxidised Bracelet: Includes tips on how to re-oxidise your bracelet! A Review of the Pandora Bangle: An extensive review of the Pandora charm bangle, looking at fit, styling and how to avoid scratching. Which Pandora charms would you like to see in the future? : A post showcasing all the charm designs I’d love to see made. Pandora on YouTube: An overview of the best videos showcasing YouTubers’ Pandora bracelets! Does pandora shop charge if i takey braclet in? As my charms stuck on it ? Hi Nicole – it depends whether you’re in warranty or not. They should fix it for free if it’s a fault with a Pandora charm or the Pandora bracelet itself, and they’re still in warranty. If it’s a non-branded charm that’s causing the problem then most likely they will charge you or refuse to do anything with it. Hope you get it sorted! They may possibly charge you then… It’s up to the discretion of your store unfortunately! Will it be alot do u think? Have you had any dealings with Pandora-Outlets.com?? What was your experience? The link doesn’t appear to be working for me but with a URL like that I would imagine that they are not selling genuine Pandora items! 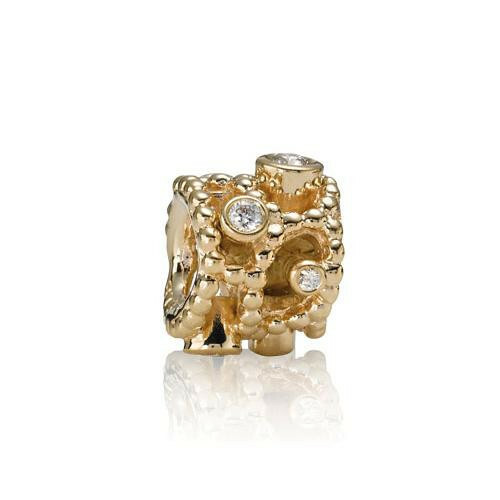 Can you tell me about the Pandora 25th Anniversary Bead? What would you like to know? :) It’s 14kt gold with 0.25 carat diamonds, was released back in 2011 to celebrate the company having existed for 25 years. How much did it sell for originally and how much is it worth today? Apparently it sold for $1,100 USD originally. I have never specifically seen/noticed one for sale since, and I can’t find one listed on the pages right now, so I’m not sure what they fetch currently on the secondhand market. I have another question. This time it’s about the HTF Rander’s Frog. I have just purchased one for $1800.00. Was that a reasonable deal for that charm? Also can you tell me a little about it and what kind of box was in it originally. I really appreciate your web and knowledge of Pandora jewelry. Keep up the good work. Hi Paula! The Randers frog is probably the rarest Pandora charm there is… no one knows how many exactly were made, but it was a very small and limited release. It’s hard to put a price on it, as they come up so rarely. I have seen them listed for £1,000 but don’t know if they sold for that. It didn’t come with any special box as far as I’m aware. Hi! :) I don’t ever dismantle my bracelets unless I am rearranging or actively cleaning them, so you will be fine! There’s no need to store your bracelet and charms separately. Hi again! thanks so much for this reply.. gives me relief actually.. need to hear this from the expert.. ??? Hi… I have a couple of charms that wont stay upright. Any suggestions? Thank you! Hi! There’s not much you can do about charms that flip, unfortunately. Some charms are just weighted poorly. The more charms you have on a bracelet, and the tighter they are placed together on the chain, the more likely you will be able to keep them in place. Some people have also had success with openworks charm by putting silicone stoppers inside the charms to fix them upright. Hi, I just got my first pandora bracelet! I’m so excited that I went out the next day and bought two more charms to add to my first dangly one. My question and I apologize if anyone else had this already somewhere else on your blog, is there anyway to keep the charms from flipping over and being face down all the time? I bought one for each of my dogs…one is a heart with a paw print and the other is the food dish with a bone on top. They are NEVER facing up and it’s kind of disappointing, is this normal? Sorry, as soon as I finished this message, i browsed from bottom up and saw my question was just answered above! Hi , I have just received a new bracelet and mickey charm from my lovely hubby, I collected Pandora in the past years ago, boy how they have changed, I am a vet nurse and collected the animals. I have a thing for the rare , limited and discontinued, having read your blog on fake and the hundreds of sellers on eBay all claiming to have old new stock , I don’t know where to go to source older charms, are there clubs etc that have sales sections …. Are you able to recommend sellers ? Some of the retails sites are just way to cheap to be genuine. These scoundrels are really ripping us off taking genuine customers away from Pandora must impact the retail prices. Anyway any direction would be amazing. I need a dancing lion, any suggestions ?? I love your blog and have learned so much, thank you for your amazing blog. Thank you so much Ellie for all you do on this site. I wish I would have found you earlier before I purchased my first bracelet this year. Even though I enjoyed my experience in the Pandora Store and had a knowledgeable sales person I should have followed my gut and bought the bigger size bracelet. I did explain to her chances of me gaining weight are “pretty good!” and with the summer humidity I will expand ;) and I did. My bracelet never stretched like the sales person and the Pandora site state may happen. Plus I never thought that the once I fill the bracelet with charms it becomes tighter. Thank you for all the information, photos, styling ideas, release dates, sales info, etc., etc. that you supply! You are a wonder and I don’t know how you find the time to do it for the UK let alone the rest of the world, I’m USA. I also enjoy everyone’s comments, I learn so much. For me Pandora is an investment in the sense that it is not costume jewelry that I wear one season and done. I think about what I am going to buy and save to get it. I have a traditional charm bracelet from my childhood and last year when we went to Disney I was going to add to my bracelet only to discover that they have shifted to Pandora. I didn’t buy anything then and there but went home to think and think and think. So here I am collecting the Disney line, having fun and smile every time I look at my wrist. To end my long story I did get a bigger bracelet for Christmas, Disney parks, and it is much more comfortable and easier to put on. My other Mickey bracelet I may leave empty when wearing. I hope anyone thinking about Pandora finds your site first! Thanks again! I just wanna say I love your blog. I’m new to the Pandora universe and I love all the information you offer to all of us. I just started my bracelet and I have quite a few charms. I was reading only about the clips and I found a few reviews about people losing the clips because they open on their own. It would really break my heart to lose a clip if that’s something that happens a lot. Have you heard about this before? Have you had any issues with this before? My apologies if anyone else had already asked about this somewhere else on your blog.